The Sanus VMF620 will let you tilt, swivel, extend and level your TV without the need for tools once installed. This is actually a true feature of the TV I found to be very nice. not mention it can be mounted over power outlets which is very handy. The extension turned out to be a savior as well. I used it mostly for mounting a TV in a tight corner that would otherwise be empty. The VMF620 is a very good wall mount and supports a decent range of VESA patterns to boot. Below is some more details information. Even though the VMF620 only supports 4 inch to 50 inch TVs it has a decent range of supported VESA patterns. I’ve listed those below. If your VESA pattern is not found below, then it will not be able to support your TV. Also note that if your TV is too heavy, that this wall mount may not support it either. Inside of the wall mount details the weight is listed. 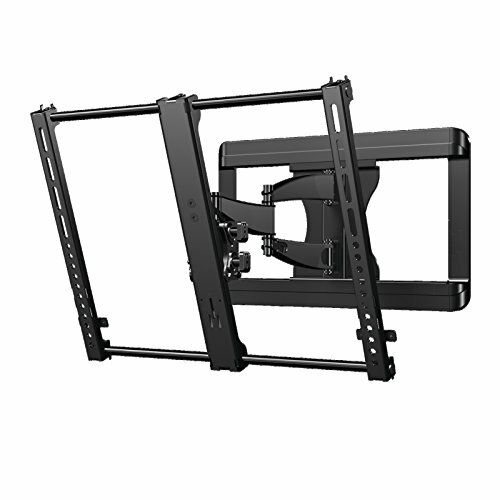 since larger TV are heavy and require more materials to hold them up, you’ll also find that you will need more tools to properly install a wall mount meant for holding up that same large TV. This can be said to be true for the VMF620 as well. Below are the needed tools for a quick and easy install. Some of these tools are only needed if you are installing the wall mount into a concrete or dry-wall surface. Remember this before gathering too many tools. The instructions are very simple and easy to follow. It’s always a simple 1, 2, and 3 process with Sanus products. If you get lost I’ve broken the steps up a bit more below. Good luck! 1-1 Find the TV screws and insert them into the back of the TV. 1-2 Determine if the provided spacers are needed. 1-4 Using the correct bracket, attach to the VESA holes on your TV. 2-2 If you have concrete walls, measure and apply wall anchors. 2-3 Once holes are made or anchored, attach wall plate to the wall. 3-1 Final Step The locking tab needs to be in the unlocked position before attaching the TV to the wall plate. Once the TV is on the wall plate, the locking tab needs to be in the locked position. HEAVY! You may need assistance with this step. If you are new to wall mounts and have a medium to large sized TV, this wall mount will be perfect for you. Everything worked well and the quality of materials used is top-notch. SANUS VSF409. A Cheap TV Wall Mount. My name is Kenneth and I’m the “us” around here. I run Top Rated TVs and have been involved with technology for the past 6 years. This lead me to learning many things I’d like to share with you. I love anything that has to do with TVs from the amazing technology they run to the community that surrounds it all. Top Rated TVs is a participant in the Amazon Services LLC Associates Program, an affiliate advertising program designed to provide a means for sites to earn advertising fees by advertising and linking to Amazon.com. 2018 Top Rated TVs. All rights reserved. | All views expressed on this site are my own and do not represent the opinions of any entity whatsoever which I have been, am now, or will be affiliated with.